Utilizing a stability ball instead of a desk chair is a popular way to burn more energy while working. Thanks to sedentary occupations, most people spend about six hours a day sitting in a chair. This reality isn’t just causing our waistlines to expand and our muscles to atrophy -- it’s actually shaving years off our life expectancies, according to research published in 2012 by the Pennington Biomedical Research Center in Baton Rouge. The first step to combating the health risks of sitting is to get up and get moving, even if it just means walking across the office to talk to a co-worker instead of firing off an instant message. Though not every office is equipped with a state-of-the-art gym, many pieces of equipment are available to help you take in-office physical activity to the next level. When it comes to office exercise equipment, think small and portable. The Mayo Clinic recommends doing arm curls with hand weights, which may be easily stored in your drawer or nearby office storage. Or pick up some versatile resistance bands, which are equally compact and very easy to stash. Resistance bands are lightweight and fold up easily, so you can take them on business trips, too. Sure, your office-mates might give you the side-eye as you stretch and lift your way through work breaks, but who will have the last laugh when bathing-suit season rolls around? Even the most ergonomic desk chair isn’t going to help you burn calories if you’re just sitting in it. For all or part of the day, consider swapping that chair for a fitness ball that will help you strengthen and tone the muscles of your core, all while you work at your desk. Improved balance is another positive benefit of using a fitness ball as improvised seating. 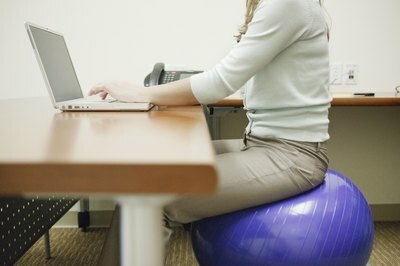 According to a 2010 “New York Times” report, there’s not much evidence backing the claim that sitting on a fitness ball will impart better posture. But take heart, because scientific studies do show that you use a little bit more energy while sitting on an exercise ball than you do while sitting a regular office chair. When you’re not sitting on the stability ball, the Mayo Clinic advises using it for wall squats during your breaks. 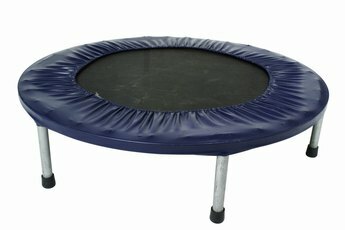 Would you be surprised to learn that some of your favorite gym equipment comes in miniaturized versions? Many ellipticals, step machines and bikes are created as compact, under-desk accessories. Up your motivational ante with electronically aided devices designed to guarantee you’ll keep burning calories, even while you’re compiling a slideshow presentation for the upcoming board meeting. For example, some under-desk step machines can be set up so your mouse or keyboard stop functioning while you’re not active. The result may be a steady climb to success in both career and fitness. When all else fails, consider your existing environment and what might prove to be an exercise asset in disguise. No external stair-stepper is required when you choose to climb the stairway instead of taking the elevator. Take advantage of sturdy office equipment to work in some tricep dips, utilizing the edge of your desk or a stationary chair that does not roll. Even a chair that swivels can become friend to your obliques, if you use it to gently twist from side-to-side while holding onto the desk. 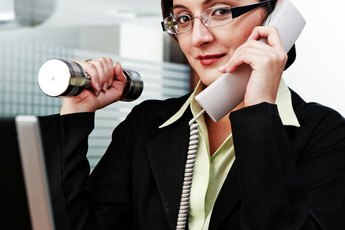 If you’re too shy to work out in plain view of your co-workers, look for an available empty space like a meeting room or a trusted colleague’s walled-off office. Do Under-the-Desk Exercise Pedal Machines Improve Circulation? What Are the Health Benefits of Climbing Stairs?